How High are the One Percent's Taxes? In many states, no higher than yours. 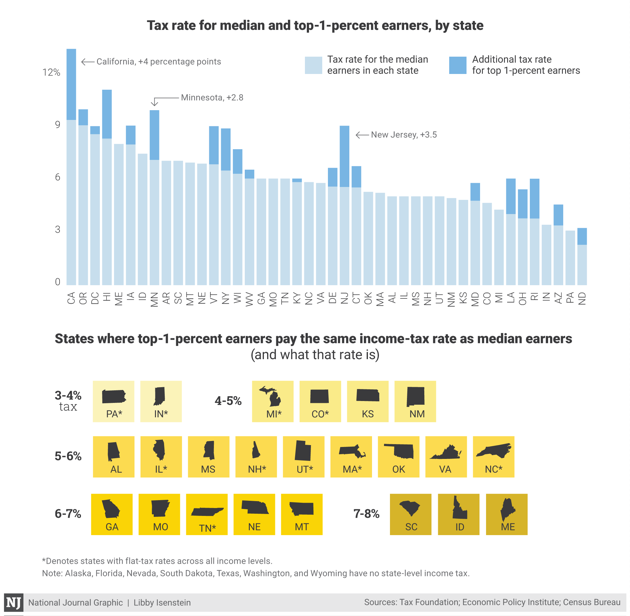 As tax season draws to a close, here is a look at the difference in tax rates paid by the middle class and the top earners of each state. While the best-paid taxpayers pay more in taxes than the median-income household in states like California, Minnesota and New Jersey, it's a different story elsewhere. Kentucky, West Virginia and the District of Columbia tax the rich only marginally more, and in 23 states, median earners pay the exact same tax rate as the top 1 percent.